Living a Fit and Full Life: Reclaim Your Beauty with Beauty Boost Capsules From Vital Proteins! + Giveaway! 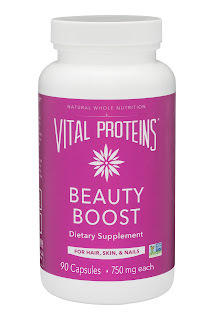 Reclaim Your Beauty with Beauty Boost Capsules From Vital Proteins! + Giveaway! Reclaim your beauty with Beauty Boost Capsules From Vital Proteins! I'm head over heals in love with these Beauty Boost Capsules From Vital Proteins! I've only been taking these capsules for about 2 weeks but I'm already seeing amazing results. I'll admit my hair was thinning incredibly bad. I attributed it to being a mom of 4 who gets very little sleep but in just a couple of weeks my hair already seems to be thickening up. I seem to lose less hair in the shower and the only difference is these Beauty Boost Capsules From Vital Proteins. Even my nails seem stronger and have been growing like crazy which I love because they actually look good and aren't breaking like they used to. I also think me skin looks healthier and cannot wait to see how well it looks as more time goes on. 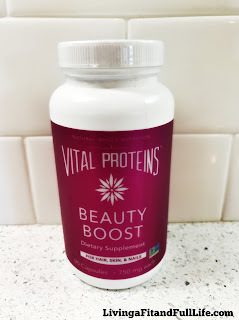 Beauty Boost Capsules From Vital Proteins work amazingly well and I highly recommend them!